We're back with internet connection after five lovely days on Surin Islands, but more about that in another blog post. 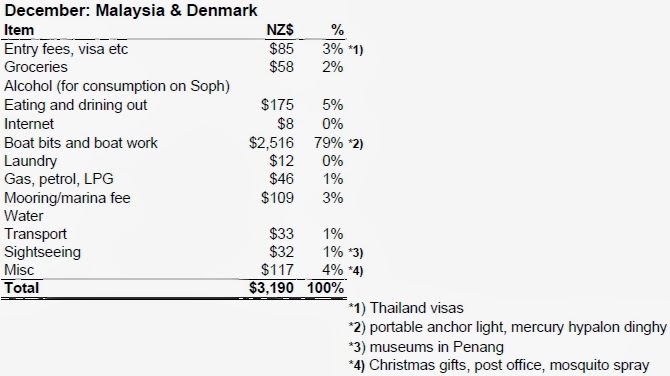 I have included December's expenses (NZ$3190) although it's not very representative for two reasons. First of all it includes our new dinghy which is a massive cost layout, for us anyway, at $2508. The old dinghy was literally falling apart and has been the last half year or so! We hope this new dinghy is a good investment over time, and it definitely should last a lot longer, it is also 2.5 times more expensive! We ordered it from Defender in the USA and had it shipped to Langkawi. We found it better value and also better quality than what we could get locally. We were however quite limited in choice as it has to fit exactly under our solar arch to get the biggest size possible, yet it's still a small dinghy compared to most other cruising dinghies around. Secondly, we only spent roughly half of December on the boat in Malaysia, the rest of the time we flew to Denmark for Christmas holiday! We probably wouldn't have spent a whole lot more if we had stayed on the boat, as the marina costs would be roughly equivalent to extra food and eating-out costs. If the dinghy is excluded, it would have been a cheap month, maybe $700 or so. My parents were kind and very generous and actually paid for our flights to Denmark, and I have not included our few expenses in Denmark. To fly home from somewhere (far away) isn't cheap and would roughly equate one or two months' cruising expenses! Definitely worth considering. On the 5th of January we were back in Malaysia and only spent a couple of days in Langkawi before we sailed to Thailand. Louise visited us for two weeks, and so both with her and on our own, we have been eating out a lot (say Thai food...), so we feel like it was an expensive month. 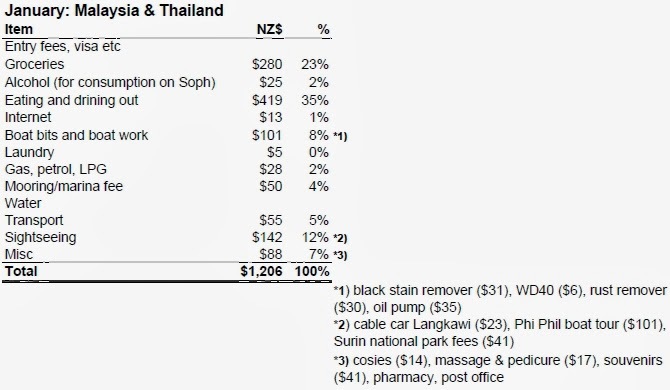 In total it was 'only' NZ$ 1206, so not too bad, but eating out was by far the biggest expense that month. The supermarkets are also pretty good, so some spending there too.